EAST HARRIS COUNTYOn Nov. 6 voters will go to the polls to decides issues of state and local importance. Due to change made during the last State Legislative Session school trustee elections were moved from May to November so that they could share ballots with other elected offices as well as proposition elections. Among the issues facing voters this year are changes to the Texas Constitution. Sixteen proposed amendments are going before voters. The four that have gotten a large share of the attention are Props. 4, 12, 15 and 16. Prop. 4 calls for funding for Department of Public Safety crime labs. Prop. 12 would raise $5 billion in state highway bonds, Prop. 15 would allow for the creation of a $3 billion Texas Cancer Research Center and Prop. 16 would raise funds for water and sewage projects in low-income areas such as Northeast Houston. The Harris County Commissioners Court is asking voters to approve $800 million in bonds. The money would then be split between the four county precincts with each commissioner using their funds as they see needs within their district. Aldine ISD will hold a school board election for Positions 1, 2, 6 and 7. Marine Jones holds the Position 1 seat. Joe Nailor will join Jones in the Position 1 race. Dr. Alton Smith holds the Position 2 seat. He is unopposed in the Position 2 race. 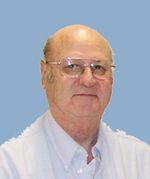 Merlin Griggs holds the Position 6 seat. Art Murillo will join Griggs in the Position 6 race. Dr. Viola M. Garcia holds the Position 7 seat. Raul Garza will join her in the Position 7 race. Both Trustee Silvia Brooks-Williams, who was appointed by the board in 2006 to fill the unexpired term of former Trustee Jarvis Clark and Board Vice-President Allen Provost filed to run in the Position I and Position 6 races, respectively. Veteran Trustee Maxine-Lane Seals, who has served on the North Forest ISD Board of Trustees for a total of 19 years did not seek reelection. Albert Coleman and Gary Pratt will challenge Brooks-Williams, 64. Henrietta Cage and Jackie Mayhorn, 47, who works as a change manager in information technology, will face Provost for Position 6. They are Roy Rabbit Grant, Loutrice Hicks-Holmes, Willie Hunter, Albert Lemmons, 62 and Paula Sharon Settles. The Houston ISD will seek voter approval $805 million in bonds. The lions share of the bonds, estimated at $383 million, will go to build 24 new campuses. The district also plans expansion and renovations at 136 campuses while another $90.3 million will be spend on security upgrades at every campus. Upgrades are also planned at Barnett, Butler and Delmar Stadiums. Polls will be open from 7 a.m. until 7 p.m. The trustee election is being held in conjunction with the City of Houston elections. Nearly 5,000 Aldine ISD fourth graders jammed the M.O. Campbell Educational Center to attend the annual C.H.I.C.K.E.N. (Cool, Honest, Intelligent, Clear-headed, Keen, Energetic and Not Interested in Drugs) Club kickoff on Oct. 23. In addition to hearing from motivational speaker James Hudson Jr., the students were entertained by TEAM ACRODUNK, a group of high-flying dunkers who thrilled the crowd. 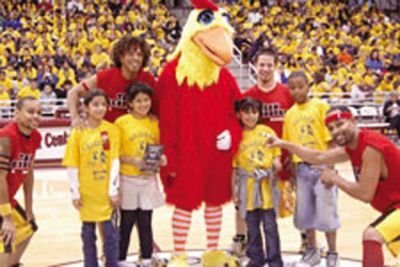 Pictured are TEAM ACRODUNK members with the Aldine CHICKEN and a group of students who assisted TEAM ACRODUNK members with some of their dunks. The students were also treated to performances by the MacArthur Senior High Brigade Bells and the Nimitz Senior High Starboard Angels. The C.H.I.C.K.E.N. Club is an anti-drug club that focuses on fourth graders throughout Aldine ISD. NORTHEAST Fifteen local firms have been nominated as Small Business of the Year, and five of them will receive the honor at an Awards Banquet to be held next Thursday, Nov. 8th at the Crowne Plaza Greenspoint hotel. The award is presented by the Small Business Development Center of North Harris Montgomery Community College District each year, to one business in each of their college districts that has demonstrated contributions to the economy and the community. Tomball College District: Chaparral Management Company, Schulte Building Systems, LP, and Servpro of Spring-Tomball. The title sponsor of the awards banquet is Capital One Bank, the Silver sponsors are Amegy Bank and UHY Advisors. The finalists met last week at a luncheon, where they were ackowledged and given an insight into the awards program. Speaking were Vice Chancellor Ray Laughter, on the History of the Small Business Award, and Sal Mira, the Director of the Small Business Development Center. Also speaking for Capital One was Jack Legendre. The awards banquet will be hosted by the new chancellor, Dr. Richard Carpenter, and may include an announcement of the new name for the district. 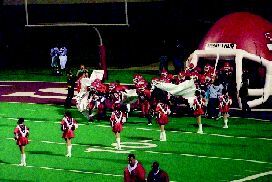 THORNE STADIUM Entering last Friday nights game with a 6-1 overall record, the Nimitz Cougars were expected to romp over the MacArthur Generals, whose 2-5 record didnt seem to compare. But MacArthur put together a strong running game, under the direction of coach Jerry Drones, and ended up on the winning end, 21-10. In fact, by scoring twice in the third quarter within three minutes, they actually dominated most of the game with smartly executed play. An outstanding performance was put in by Macs Isaac Lewis, who ran for 9 carries and 129 yards, and one touchdown. Touchdowns were also scored by Javis McQueen on a 2 yard run in the first quarter, Roger Nunnery with a 4 yard run, and Isaac Lewis with a 16 yard carry, the latter two TDs in the third quarter. Neither team showed much of a passing game, although Nimitz completed 6 of 9 pass attempts, for 36 yards total gain. The win moves MacArthur up in the district standings, to fourth in 19-5A. NORTHEAST HOUSTON A.C.T., The Aldine Communities Together, hosted the annual Fall Festival Fundraiser last Saturday, at the Sheriffs storefront location. Activities included carnival games, silent auction, Escamilla choir, a Moonwalk furnished by the Aldine Optimist club, police cars and firetrucks, food, popcorn, and more. ESD#1 was on hand with their mobile medical trailer, to administer flu shots. Hundreds of children and adults turned out for the annual event, according to organizers Shirley Reed, and Sheriffs deputies Parnelle Roy, Lee Bumper, and Karen Jordan. The event is a fundraiser for the sheriffs storefront, and other childrens activities related to the A.C.T. organization. But theres something missing. Though I am doing a lot of things for myself — reading for leisure, practicing piano, playing sports — I feel less personally fulfilled than I did in college. As a Resident Assistant and student leader, I practically had meaning thrown at me. 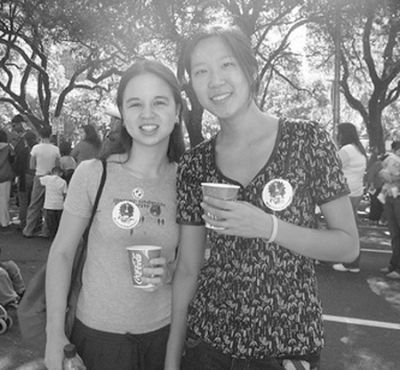 I assisted my fellow undergrads almost 24 hours a day, arranging study groups, volunteering sessions, or trips to the emergency room. While I dont necessarily want to be on-call all the time again, I do want to feel like Im contributing to my community in some larger way.